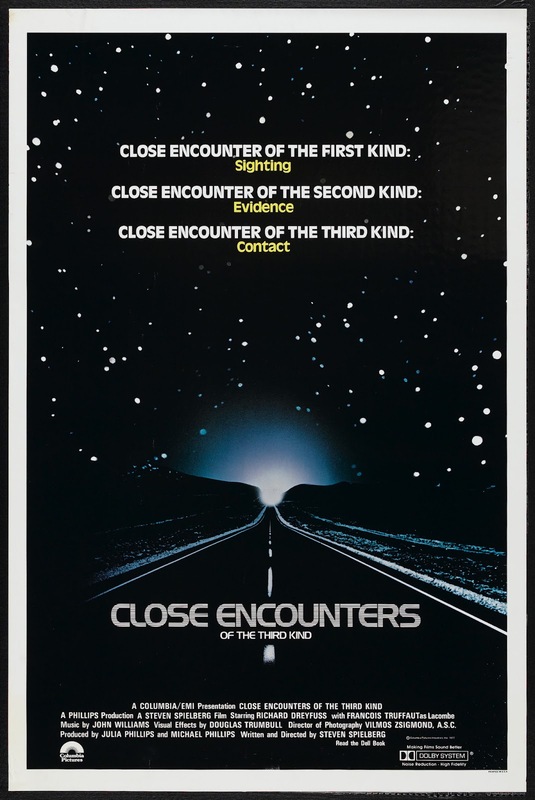 Close Encounters of the Third Kind (1977) is a semi-remake of Spielberg's first film Firelight, which is now lost. Scientist Claude Lacombe encounters a group of fighter pilots from World War II mysteriously dropped into the desert. They haven't aged a day. A child's toys all turn on at once and he wanders outside. His mother chases after him. Electrician Roy Neary has his face partially sunburnt when brightly lit objects flies over his truck at night. Soon, those that saw the objects are plagued by visions of a mountain. Close Encounters is an unconventional story. It still has the hallmarks of a narrative, but it keeps you guessing as to what and why the characters do what they do. Even by the end the alien intentions are still mysterious. The glue of the story is the passion held by the characters to discover why they can't get the mountain out of their heads. Roy Neary is an electrician who enjoys modeling and sculpting in his spare time. He has a wife and three kids, but family life has begun to wear him down. After seeing the ships, he becomes increasingly unstable. His obsession drives his wife and kids away and he's left with nothing, but his desire to get the image of a ship out of his mind. This decline eventually draws him to the next stage in his life. Janine Guiler's son being abducted by the aliens is the catalyst to her journey. In a lesser story there might be a romance between her and Roy, but not this one. Her only goal is to save her son and Roy is the only one willing to help her. Janine proves to be a capable woman and is even more willing to deal with the insanity going on than Roy's wife. Claude Lacombe is a scientist who has been on the trail of aliens for years. He has finally managed to figure out where the aliens want to meet. After meeting with Roy and Janine he becomes sympathetic to their cause, but he can't aid them on their journey. The Military is not really a villain per se. Their desire is to prevent panic and be sure that the aliens are actually harmless. It's nice to see that in an alien film, since most of time the military is evil. The Aliens are more an unknown force with little known motive or reasoning. They manage to be jovial and friendly in one scene, threatening during Barry's abduction, and serene during the climax. The film is beautifully shot from suburban Indiana to the middle of Wyoming as is to be expected from Steven Spielberg. The alien ships are amazing. The brightly lit shapes in prime colors give off a vibe that has come to be recognized as futuristic. The climax is a bit confusing. The film has a tremendously positive perspective on human acceptance. Roy's actions come off as strange, though after what he's put through it isn't that surprising. This is a prime example of a film that succeeds despite the lack of a primary antagonist. The story could best be described as man vs. the unknown. I think the humor laced through helps hold the confusing bits together. Roy's story is one of never being to old to be inspired and try new things, though they may leave your old life in shambles. THis is a must see for fans of science fiction. I'll continue next time with another alien film: E.T. the Extra-Terrestrial.